So, I kept seeing "spiralized" veggies all over the internet the past few months. What in the world does that mean, I wondered. Well, I decided to investigate when I was spending too much money shopping at Target and stumbled across a veggie spiralizer for $15. Can't go too wrong, right? Right!! Spriralizing is a great concept. You've likely already seen my cauliflower crust pizza which essentially allows you to make a pizza with no carbs. 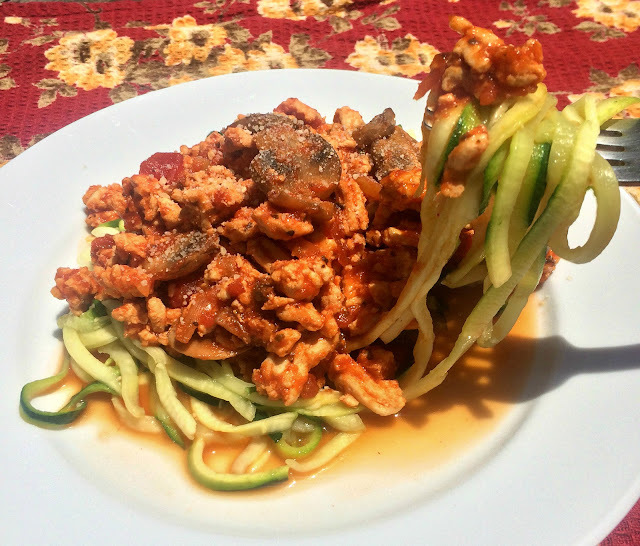 Spiralizing is the same idea... zucchini "noodles" in place of pasta. 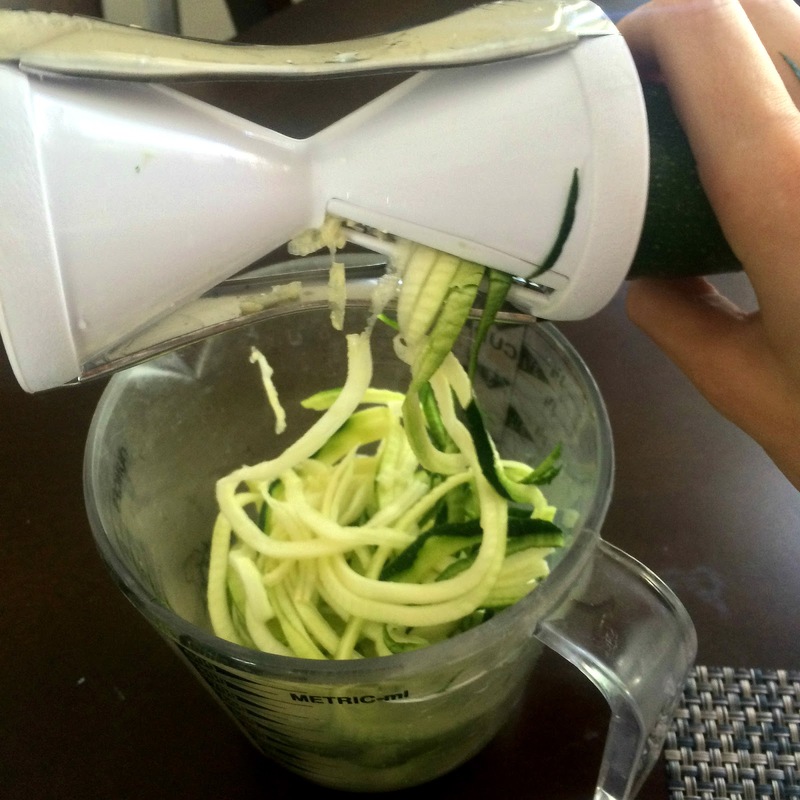 You can pick up this handy dandy Vegetti spiralizer from Target or Amazon. There are other brands out there as well. 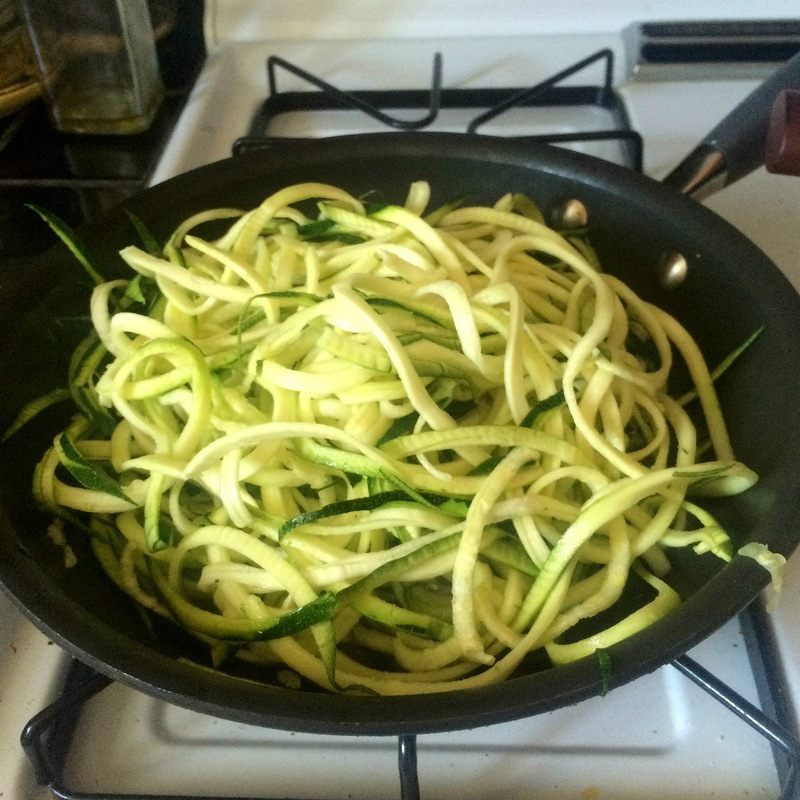 Even better, you can spiralize all kinds of veggies. Sweet potatoes, squash, regular potatoes... think potato pancakes! Once you spiralize, simply steam or saute the veggies for a few minutes (or you can eat them raw if you make a salad or some other dish). I wanted a super veggilicious filled spaghetti, so I added 1/2 an onion to my lean ground turkey during the browning stage. Then I added mushrooms right before I added a 16 oz jar of marinara. I simmered the sauce for a little while until the mushrooms were soft. And voila! 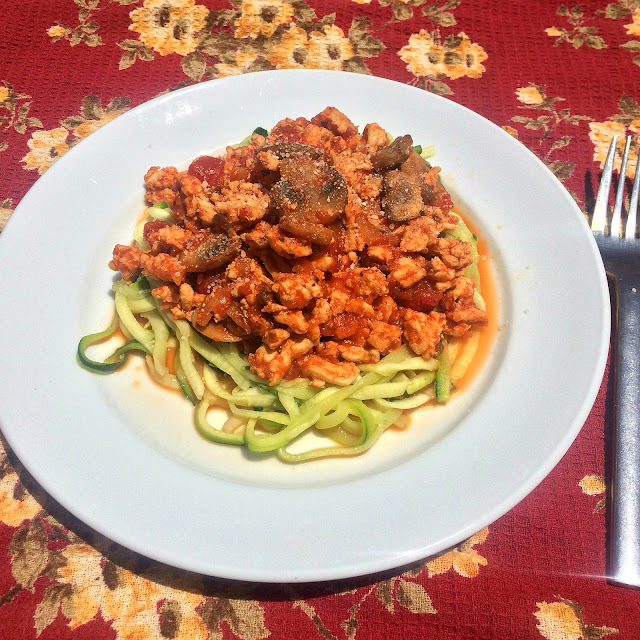 Top your zucchini noodles with the sauce and call it a day. You can also warm up the noodles and sauce for leftovers. As you can see, the noodles create a bit of water, so make sure to let them drain on a paper towel before consuming (which I did not do). You can also sub turkey with ground beef or go meatless. Or, if you really wanna kick it up a notch, make your own marinara. 1. Brown turkey on medium high with onion until almost cooked through, then add mushrooms and finish cooking. 2. Combine marinara with turkey and let simmer until mushrooms are softened. Add salt and pepper to taste. 3. Spiralize zucchinis according to Vegetti instructions and steam according to chart included in package while sauce is simmering. 4. When zucchini is softened, let drain on a cheese cloth or paper towels. 5. Place zucchini noodles on a plate and top with sauce.